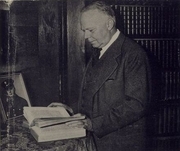 Samuel Shellabarger wrote mysteries using the pseudonym John Esteven. Samuel Shellabarger was an American academic and author of both scholarly works and best-selling novels. He was a skillful linguist who spoke and wrote French, German, Swedish, Italian, Dutch, and Spanish, and was knowledgeable in Greek and Latin. He originally used pen names for his fiction, while continuing to write scholarly works and teach under his real name. But his meticulously researched historical novels, which he began publishing in the 1940s, proved so popular that he started putting his own name on them. Shellabarger has been compared to Alexandre Dumas for his rapid narrative style, highly developed characters, and vivid, colorful depictions of the past. Some of his books were made into classic films. Samuel Shellabarger is currently considered a "single author." If one or more works are by a distinct, homonymous authors, go ahead and split the author. Samuel Shellabarger is composed of 8 names. You can examine and separate out names.